With its fragrant, showy springtime blossoms, the magnolia offers gardeners a glimpse of spring and summer bounty. California gardeners can grow several types of magnolia trees. Purchase container saplings in the spring or fall and plant the trees straightaway. Magnolia trees need little pruning and care once established, according to the Magnolia Society. Since California has a long dry season and frequent drought conditions, gardeners must water the magnolia tree often. Purchase a magnolia recommended for planting in California in the spring (see Resources). Gardeners can select the saucer magnolia, lily magnolia, star magnolia or magnolia galaxy, among other cultivars. Select a site that offers your magnolia tree enough room to mature, protection from wind and full sun. While magnolia trees can grow in part shade they will develop fewer flowers. Southern California gardeners may wish to provide the tree with afternoon shade. According to the University of Minnesota, magnolia trees will grow fine in any soil except those that are highly alkaline (above 8.0 pH). Dig a hole for your magnolia tree that's twice the size of the tree's root ball. Remove rocks and weeds from the hole before planting. Pull your magnolia tree from its container. Separate out the roots gently, unwinding or untangling any tangled roots. Then place the magnolia tree in the hole so it sits in the same depth as it did in the container. Check to ensure the tree is vertically straight then cover over the roots to plant your magnolia. Water your newly planted magnolia tree until the ground becomes saturated. Mulch the soil around the base of your magnolia tree with a 2-inch layer of mulch. This helps the soil retain moisture. Water your magnolia tree when the soil becomes dry to the touch. In California's rainy season, withhold watering if the soil receives more than 1 inch of water per week. In the dry season, irrigate the tree weekly with 1 inch of water. Prune magnolia trees only to remove dead or damaged wood or cut off branches that crisscross other branches. Wait to prune until your magnolia has bloomed for the season, in early to mid spring. 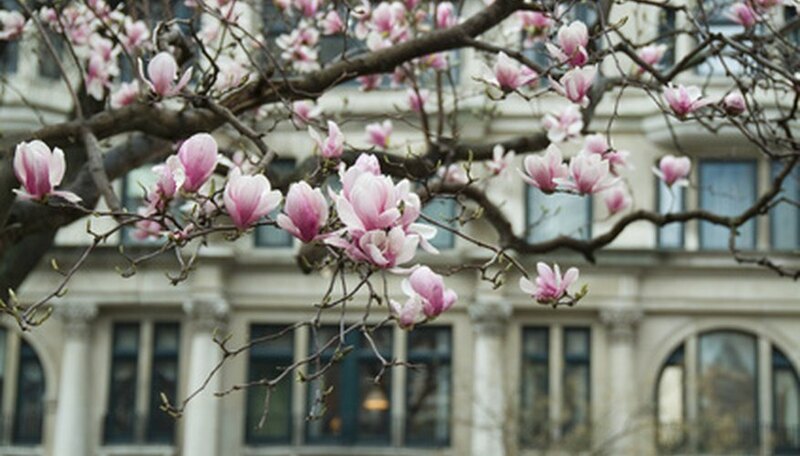 Fertilize the magnolia tree in the spring or fall with a slow-release balanced fertilizer, such as 10-10-10. Use 1 cup of fertilizer per inch of tree trunk diameter. Scatter the fertilizer on the ground in a ring around the tree, then water to work it into the soil. Buy a container magnolia tree only. The trees don't perform well when sold bare-root or balled-and-burlapped, since they have sensitive roots.